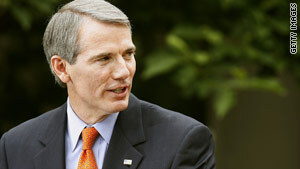 The winner of the Democratic primary in Ohio will face off in November against Republican Rob Portman. (CNN) -- The battle for Congress picks up steam Tuesday as three states hold primaries. Among the most interesting contests are a Republican Senate nomination fight in Indiana and Democratic Senate primary battles in Ohio and North Carolina. In Indiana, former Sen. Dan Coats is hoping to win back his old seat. The Republican former lawmaker, who is the establishment candidate in the race, is facing off against a number of opponents in Tuesday's primary, including former Rep. John Hostettler and state Sen. Marlin Stutzman. Conservative Sen. Jim DeMint of South Carolina has endorsed Stutzman, who is also the favorite of local Tea Party groups in Indiana. Last week, a political action committee that DeMint chairs announced it has raised more than $200,000 in campaign donations for Stutzman, who was once considered a long shot in the primary contest. But Coats is considered the man to beat. He has endorsements from conservative lawmakers Rep. Mike Pence of Indiana and Sen. Tom Coburn of Oklahoma, as well as Chris Chocola, president of Club for Growth -- an organization that preaches fiscal conservatism -- and Focus on the Family founder James Dobson. The big question is whether some conservatives will be less than inspired by a Coats victory. "I think what happens on Wednesday in Indiana is more important than what happens on Tuesday," said Nathan Gonzales, political editor of the nonpartisan Rothenberg Political Report. "Republicans will need to unite behind a Coats candidacy in order to take back a Democratic-held Senate seat. Indiana is not a Democratic state, but Coats will need every Republican vote possible to win." The winner of the primary will take on Democratic Rep. Brad Ellsworth in the general election. The race is to fill the seat being vacated by Democratic Sen. Evan Bayh, who's not running for re-election this year. It's a mirror image in Ohio, where all the action in the Senate primary is on the Democratic side. On the eve of Ohio's primary, a new Quinnipiac University poll of likely Democratic primary voters indicated that Lt. Gov. Lee Fisher held a 20-point lead over Secretary of State Jennifer Brunner in the race for their party's Senate nomination. "Lt. Gov. Fisher started the campaign better known and raised more money to keep him better known and able to get out his message," said Peter A. Brown, assistant director of the Quinnipiac University Polling Institute. The primary winner will face off in November against Republican Rob Portman, a former congressman who also served as budget director in the administration of President George W. Bush. The race is to succeed retiring Republican Sen. George Voinovich. Over the weekend Brunner told reporters that she would not campaign for Fisher if he won the primary. "There's been a lot of talk about divisive Republican primaries, but Ohio's a case of a divisive Democratic contest," said Gonzales. "In order to win this seat in November, Fisher can't afford to have Democratic voters standing on the sidelines." In North Carolina, six Democratic candidates are vying for the chance to face off in November against Republican Sen. Richard Burr. Polls suggest that North Carolina Secretary of State Elaine Marshall, former state Sen. Cal Cunningham, and attorney Ken Lewis are the top three contenders for the Democratic nomination. All three states are also holding primary contests for House seats as well as for state and local lawmakers.